Born in Detroit, Michigan, Jeffrey C. Pettys grew up in Ohio. Mr. Pettys attended The Ohio State University and received his Bachelor of Science in Business Administration. 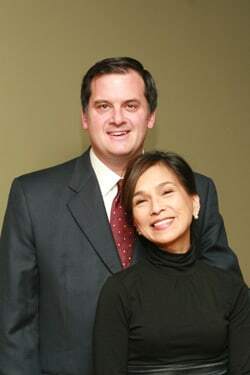 Mr. Pettys met his wife, Pilar Cusi, while attending college. Upon graduation, Mr. Pettys worked as a Commercial Banker in Pittsburgh, Pennsylvania. While in Pittsburgh, he and his wife decided to marry after a long courtship and decided to travel to Cebu Ciy, Philippines to be married. After returning to the United States, Mr. Pettys made plans to attend law school at Capital University Law School in Columbus, Ohio. He graduated from Law School in May of 1993 and immediately opened up his own law practice. Mr. Pettys has been practicing law for twenty years. His experience includes complex Civil Litigation and Immigration Law. Today, Mr. Pettys’ law practice is exclusively limited to helping people and families throughout the United States with marriage based immigration. Pilar Cusi-Pettys is a Filipino citizen and a US Legal Permanent Resident (LPR). Ms. Cusi-Pettys was born in Cagayan, Philippines. Ms. Cusi-Pettys is a graduate of De La Salle University, Manila, where she obtained her undergraduate degree in Economics. After graduating from De La Salle University with academic honors, she obtained her Master’s Degree in Business Administration from The Ohio State University, in Columbus, Ohio, USA. Upon graduation, Ms. Cusi-Pettys started her business career as a Commercial Banker with one of the largest U.S banks. She has worked in Commercial Banking for more than 25 years.